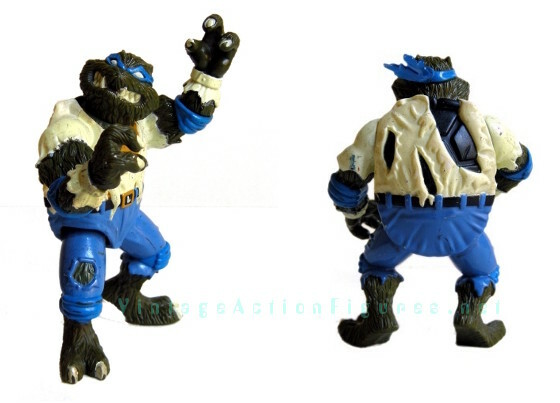 During the late 1980s and early 1990s Playmates Toys invented some wonderfully imaginative scenarios for their Teenage Mutant Ninja Turtles action figures with endlessly creative variations. These weird and wonderful figures seem to divide collectors straight down the middle, but love 'em or hate 'em, there's absolutely no denying the sheer quality of the designs. 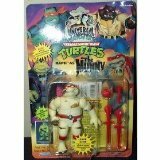 As a Universal Monsters movie fan, the 1993 first wave of Official Universal Studios Monster Turtles, which saw our reptilian heroes disguised as Frankenstein (Mike), Dracula (Don), The Mummy (Ralph), and Leo as “The Wolfman” (rather than “Wolf Man”), has always been high on my list of must-haves. I was thrilled by this recent flea market find, therefore. Leo may have seen some heavy play and suffered more than a little paint loss, but these 4 ½ inch figures were solidly built-to-last, and he's a great starter figure in this series. 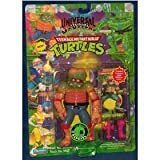 I was a Teenage Mutant Turtlewolf! The 7 points of articulation at the neck, shoulders, elbows, and hips, are rather limited, but he can nevertheless be positioned in ferocious werewolf poses with his raised claws. 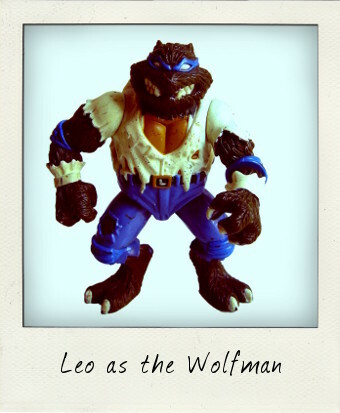 He is essentially the perfect blend of both the Wolf Man and Leonardo, with his torn clothes, wonderfully sculpted Turtle-green “fur”, savage fangs, and typically canine hind legs, combined with his usual blue bandana, turtle shell, elbow pads and “L” buckle on his belt. The original figure was issued with four themed accessories: a Boney Kantana, a Wolfhead Cane,a Fiendish Foot Trap, and a Silver Bullet-Shootin' Gun, which were cast in orange, purple, red, or blue plastic. 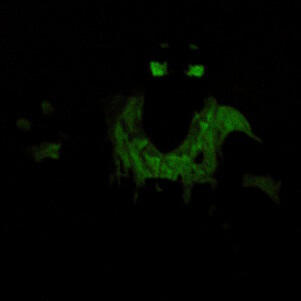 My loose figure has sadly lost all of his extras, but his coolest feature still works beautifully – turn off the lights and his shirt, teeth, eyes and claws still glow in the dark thanks to the special paint apps. Collect them all...you KNOW you want to!